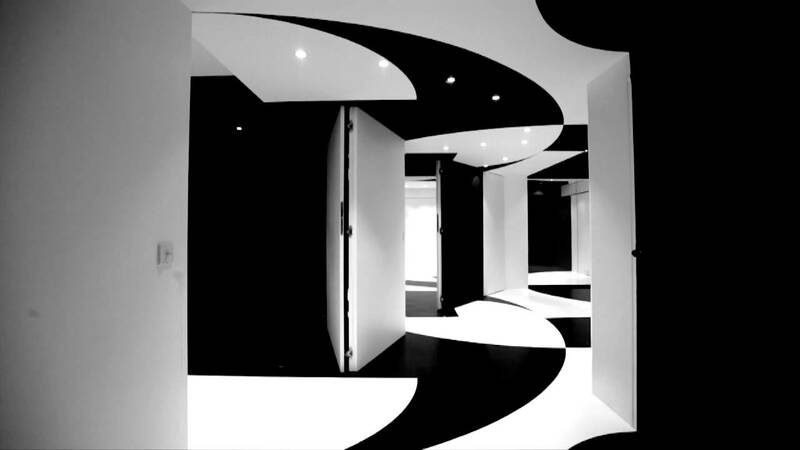 Settled in the 13th district of Paris, a few steps aways from the Héloïse and Abélard’s square, Agoratic’s brand new office propose several digital training rooms , temporary offices, meeting rooms. Nowadays it mostly work as a showroom and exhibition space. The scope statement essentially included a need for multipurpose spaces . To facilitate the use of the office, we’ve created, developped and patented floating walls systems, suspended 3mm above the floor and below the ceiling. Theses elements that includes walls and full height doors are patented under the name of MuMo ( Mur Mobiles in French, meaning Mobile Walls ). This system enables to create multiple combinations of various sizes of spaces ; The movement of the MuMo draws multiple axis of rotation ; The black and white masses are the results, the physical footprint of this circular motion.The axis intersections are treated as a set of a tree-dimensionnal chessboard, with alternating light and dark squares boxes. The architecture of La Nouvelle Heloïse materializes a space with multiple ways to discover space, with flexibile and and autonomous structural system. This bicephalous space experiments visual distortions ; false mirrors, symetries and real time fish-eye effect. As a polymorphous space, a monochrome camouflage, bicephalous, La Nouvelle Heloïse frame and dissolves the space with an ambiguity of its own ; between a familiar space with retro references and the invention of a futuristic typology.